Cut off the ends of the yucca. Peel and cut into large pieces. Place in a pot of boiling water. Cook for 20 minutes or until tender. Drain water and let cool. Cut each piece of yucca down the middle and remove the fibrous core. Grate the yucca and use your hands to shape the hash browns. Heat up 1/3 cup of oil in a large frying pan. Carefully add the hash browns to the oil and fry until Golden Brown, about 1 1/2 minute. Flip and cook on the other side for another 1 1/2 minute or until completely golden brown. Remove from oil and drain excess oil on paper towels. Season with salt and pepper. Add 1 tablespoon of oil to a pot or frying pan. Once hot, fry each tortilla on both sides. Fry the eggs in the same oil. 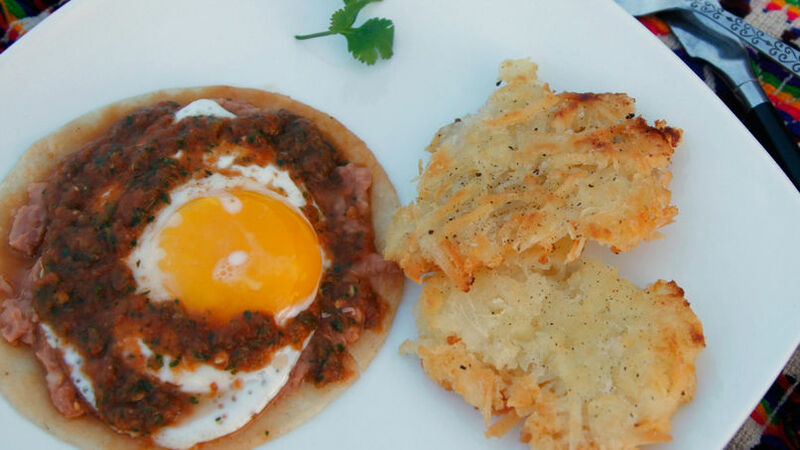 Add a layer of refried beans to each tortilla, top with an egg and salsa. Repeat with remaining eggs and tortillas. Serve with a side of hash browns. To save time, cook the yucca ahead of time and refrigerate it in a sealed container or use leftover cooked yucca. Yucca is a very popular tuber throughout Latin America and the Caribbean. Its color and consistency is very similar to that of potatoes and it makes a great substitute. Hash browns are the perfect side for your breakfast eggs. For this recipe, I used yucca instead of potatoes and I ended up with super crunchy hash browns. Try this recipe for your next breakfast.